MINI Cooper Acccessories + MINI Cooper Parts :: OutMotoring.com MINI Blog :: MINI Accessories :: Make your grill shine! Synopsis: Not your teeth, silly... driving lights on your MINI! 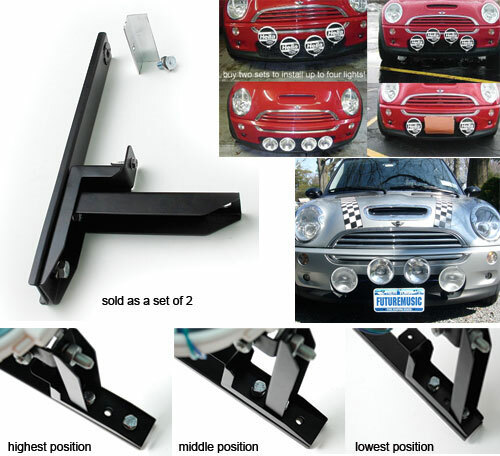 These are the new design of the Out Motoring MINI Cooper Driving Light brackets for the Gen 1 MINI Cooper which fit the 2002-2006 Hatchback and the 04-08 convertible. This new design allows 3 vertical mounting positions using the adjustable bracket system so you can position them to suit your needs. If you use 2 sets you can stagger the lights in a few different patterns, which looks pretty cool, or just run them in a straight line. These attach to bumper structure behind the actual bumper and can be installed in about 45 minutes using common hand tools. Mounting location can be determined once the bumper is put back on. Protruding mounts require holes to be cut in the lower grill. Brackets are made from laser cut and formed sheet steel that is powdercoated black. Comments on Make your grill shine!